The Blackfoot Indians were nomadic Bison hunters that roamed much of the northwestern plains of North America. They were among the first of the Indians to adopt the use of firearms and horses of the European traders allowing them to harvest Bison at a much greater rate and distance. Among the fiercest of all the tribes found in North America Blackfeet were feared by friend and foe alike and they didn’t hesitate to use their guns and horses to deny neighboring tribes such as the Flatheads access to the plains and the herds of Bison. As civilization moved westward their fortunes changed, coupled with gratuitous hunting of Buffalo by the white man depleting the herds along with the gradual placement of the Blackfeet onto reservations forcing them to adopt a lifestyle of farming and ranching. The Blackfoot Chief I’ve characterized in my painting “No more come the Buffalo”, is regaled in his beads, ermine tails and red roach headdress all significant within his life and stature of pre-reservation years and yet the resignation in his eyes more appropriately reflects the true nature of his life at the hands of his overseers. 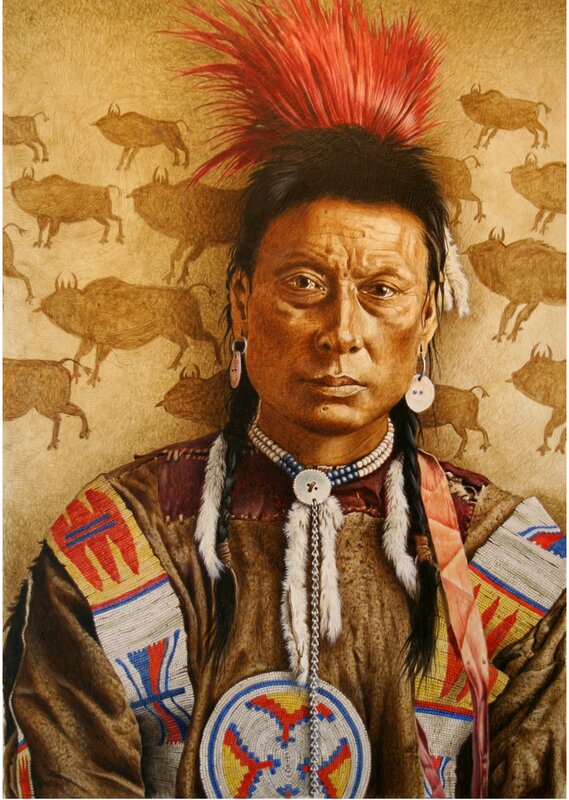 The buffalo drawings behind him are renditions of authentic Blackfoot “Ledger Art”, art drawn by the Blackfoot on ledger pads provided by the Indian agents on the reservation circa 1890-1900. Just another haunting reminder reflecting a time of plenty, the apex of a people whose civilization, who like many others, centered around the availability of the great bison herds.